Texas head coach Charlie Strong watches from the sidelines during the second half of an NCAA college football game against TCU, Saturday, Oct. 3, 2015, in Fort Worth, Texas. 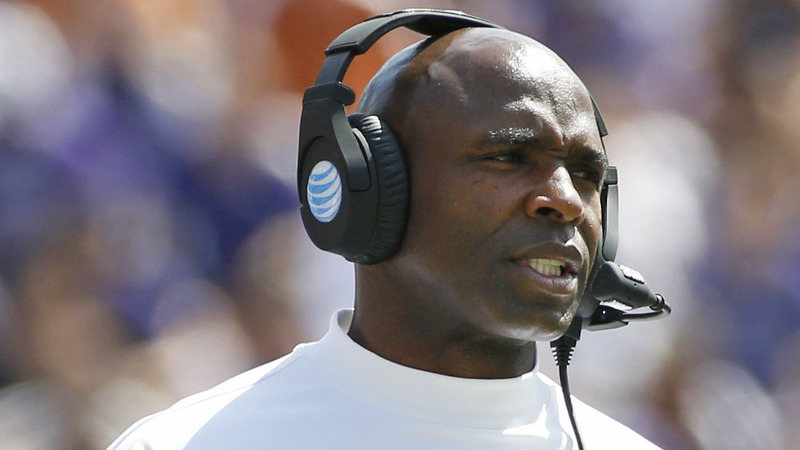 AUSTIN, TX -- The Charlie Strong era with the Texas Longhorns is over. Charlie Strong has been fired. Strong went 16-21 in 3 seasons as the Texas head coach. One day after a 31-9 loss to TCU capped another disappointing season in Austin, the Longhorns opted Saturday to fire Strong, who was 16-21 in three years at the school. "Decisions like this are tough to make. The responsibility is not taken lightly," athletic director Mike Perrin said in a statement announcing the firing. "... Coach Strong represented The University of Texas with class and dignity, and he demanded our student-athletes do the same by adhering to his system of core values. However, after thorough evaluation, the body of work over three seasons has not shown the improvement we were hoping for. This was an important year for our program to take the next step, and the results simply aren't there, so we've decided to make a change. "We appreciate Coach Strong so much, are grateful for all he has done with our program and wish him the best in the future." Texas (5-7, 3-6 Big 12) again failed to clinch a bowl bid in 2016, instead finishing with its third seven-loss season under Strong, who was 12-15 in Big 12 play.He is the first Texas coach with three consecutive losing seasons in program history. Strong is owed a buyout of $10.7 million for the remaining two years on his contract, a fee that would be reduced if he were to take another job. The decision means Houston's Tom Herman is the likely candidate to replace Strong, asLSUhired interim coachEd Orgeron to the full-time positionearlier Saturday. Strong stressed that, despite their record, the Longhorns were well-positioned for future success. "The foundation has been laid here," Strong said. "The thing is, we've been building it for three years. Even when I looked at it, I said the third year we'll make progress, the fourth year will be our year. "It's just like baking a cake. The cake has been baked. The only thing you need to do now is put the icing on it and slice it. That's what this team is. The cake has been baked. Now it's just ready to be sliced." Strong called the firing a "very difficult day" in a statement Saturday. "I'm most disappointed for these kids and our staff who have poured so much of their lives into this program for the last three years," he said. "I do understand that it comes down to wins and losses, and we have not done our job in that area yet. I accept full responsibility for that, but know in my heart that we accomplished our primary goal, which is the development of young men. ... There are very bright days ahead, and I'll be pulling for these kids no matter where I am." Strong's final season at Texas began with a 50-47 double-overtime victory over Notre Dame, which was a preseason top-10 team but entered Saturday 4-7. The win moved the Longhorns from unranked to No. 11 in the Associated Press Top 25. But that game would not prove to be a turning point for the program. After losses to Cal and Oklahoma State, Strong demoted his longtime defensive coordinator Vance Bedford and put himself in charge of Texas' struggling defense. The Longhorns pulled off an upset victory over Baylor and had an opportunity, if they won out, to finish 8-4 and save Strong's job. After close losses to West Virginia and a one-win Kansas team, coupled with Friday's blowout loss to TCU, the Longhorns instead finished at 5-7. Some Texas boosters had been exerting "extreme pressure" on Texas leadership to move on from Strong and pursue Herman, ESPN's Brett McMurphy reported last weekend. Texas president Greg Fenves and Perrin publicly offered their support for Strong during the season, and Strong acknowledged last week that Fenves would "take a long look" at the program's progress at the end of the season. But Texas' first loss to Kansas since 1938 sealed Strong's fate, sources told McMurphy last weekend, and he will finish with the worst winning percentage of any head coach in school history. "I just felt like every year it turned into being all about me, and it should never have been all about me," Strong said after Friday's season-ending loss. "It should have been about those guys being given an opportunity to enjoy the game. It never happened for them. They felt it. That's what's so disappointing is they felt they had to defend me at every turn." Strong replaced longtime Texas coach Mack Brown in January 2014, after successfully rebuilding Louisville, where he went 23-3 in his final two seasons. Texas went 6-7 in Strong's debut season and lost to Arkansas in the AdvoCare V100 Texas Bowl to end a tumultuous year in which nine players were dismissed from the program and starting quarterback David Ash suffered a career-ending concussion in his first game. Strong had been coaching through hot-seat speculation ever since a 1-4 start to the 2015 season. He demoted offensive playcaller Shawn Watson after a season-opening loss to Notre Dame and struggled through another up-and-down year for a 5-7 finish despite upset wins over Oklahoma and Baylor. After the season, Strong hired Tulsa's Sterlin Gilbert as his new offensive coordinator and brought in four more new assistants. The Longhorns finally developed a successful quarterback this year in true freshman Shane Buechele, who had 2,958 yards passing and 21 touchdowns. Running backD'Onta Foremanleads the nation in rushing and topped the 2,000-yard mark for theseason Friday. Despite that offensive talent, Texas came up short in too many close games, with losses by margins of 3, 3, 4, 5 and 7 points this season. Against Kansas, the Longhorns gave away six turnovers and blew an 11-point fourth-quarter lead. With Friday's loss to TCU, they were 1-18 when trailing at halftime during Strong's tenure.